Football head coach Derrick Hintz is a man of few words when asked to highlight five things his team aims to do this season. But he’s been busy trying to get the Yellowjacket football program back to its status as a successful program after two tough seasons saw the team fall short of expectations. Hintz himself has been with the team since 1995. 2018 marks Coach Hintz’s second stint as head coach of the Yellowjackets. 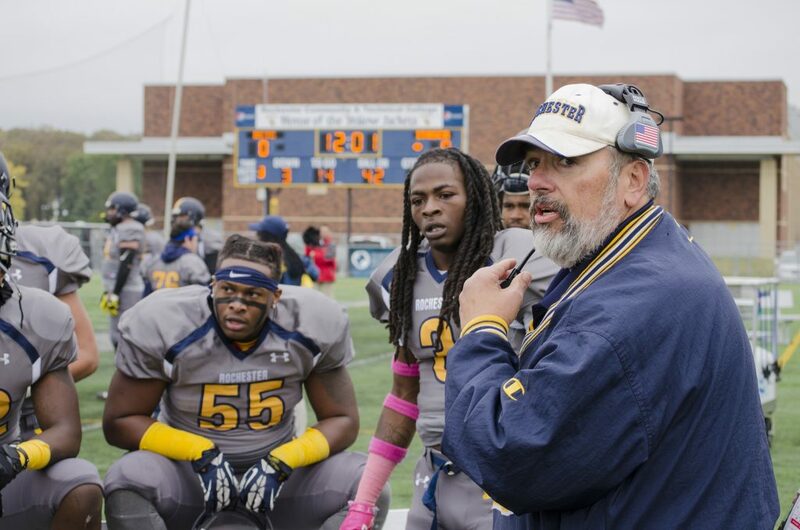 In 2017, coach Hintz served his second stint as the defensive coordinator after coaching the LB’s, OL, coordinating special teams, and serving as head coach in 2011-2012. He has an intimacy with the program, and by utilizing it and his experience coaching, he hopes to bring a team displaying the following. Football head coach Derrick Hintz. Because you can’t win games without putting up points. Because you can’t win a championship without a strong defense. The team is large this year, containing plenty of talent and athletic players. Even during a photo shoot coach Hintz commands his players. Respect and discipline are part of the Yellowjacket way, and you’ll see it on the field. Sports are enjoyed because of the tales they weave. And what makes a great story? Characters. These individuals not only have interesting stories, but each is his own character, with a unique personality. In sports, character adds to the mystique of the game, but character also pushes players forward to glory. Strong character is what’s needed to win.